In the gospel reading today we hear Jesus being asked a popular question: is suffering punishment from God? He is told of people who went to the temple to offer a sacrifice for their sins, and while they were there, the Roman governor had them killed. Did God use the Roman governor to punish them, because they were particularly sinful? And, in case they were wondering, neither were the people who died when a tower accidentally fell on them, punished by God. We’ve probably all heard people ask some form of this question. Were the bushfires God’s punishment? Was the tsunami God’s punishment? Was a freak accident God’s punishment? And why do good people suffer? Jesus doesn’t delve into the question. He just says stop thinking like that. He steers the questioners away from their philosophising about whether God is responsible for suffering and gets them to focus on how they are living. He illustrates his point with a story about a tree which is wasting precious space in a vineyard, because it isn’t producing fruit. If it continues in that way, it shall be cut down. His point is: life is precarious and precious, so don’t waste it. At the conclusion to the funeral service in our prayer book is a prayer which goes like this: God of truth and love, give us wisdom and grace to use aright the time left to us. While we have opportunity lead us to repent of our sins, and to do what we have left undone.. It is tragic when someone’s life is taken away from them, but perhaps even more tragic, is when we give away our lives, or let them slip away, because we can do something about that. Knowing our frailty though, we know that we do let our lives slip away from time to time. Some years ago, in Catholic churches during Lent, statues were covered to remind people that sometimes they lose sight of goodness. That’s one of the main reasons for Lent being a season of repentance. It’s not always the case that we need to turn around the things we have done that are wrong. Sometimes we just have to regain sight of what is good. One antidote to that is to see faith as a discipline. By that I mean to see faith as a point of view or way of living, rather than something which depends on what’s going on in our lives at the moment. Sometimes people say they don’t believe in God any more because things have not gone right for them or someone they love. The trouble there is that they have allowed their faith to depend on the circumstances of their life. 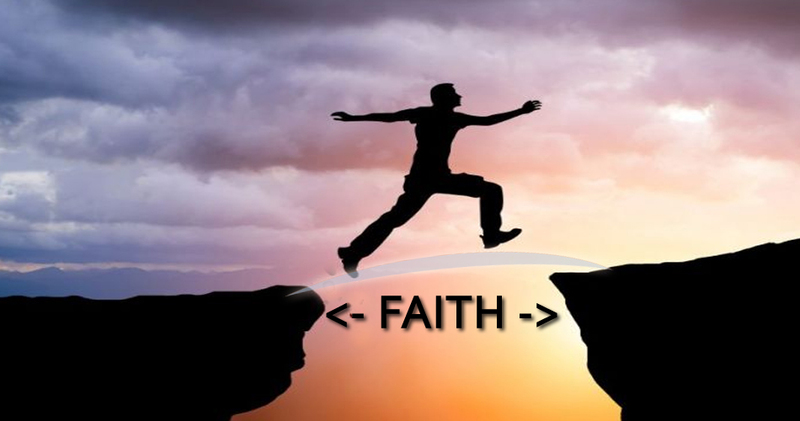 Faith must be independent of our life circumstances for it to be faith. Otherwise it’s just observation. For example, if I trust that electricity will flow through and illuminate a light bulb, it could be described as having faith, but if the bulb glows it is no longer faith which leads me to believe in it any more. It’s just observation. In a similar way, if I see things going well in the world, it’s a matter of observation, but to trust in God when things aren’t going well is faith. Faith is not something we can acquire instantly, and that’s a problem for many today, because we live in a world where if you want something, you can get it fairly quickly. In the spirit of that, things tend to be user-friendly to make it easier for people to be involved. That’s not the case with faith though. Many people want to connect with God, but they want it straight away, on their terms, or they’re not interested. And faith is not user-friendly. If anything, it can be demanding and disturbing, questioning and challenging us. If I could offer people an experience of God, here today, I reckon the church would be full, however, if I offer only the opportunity to deepen your faith, we would get the number of people we have here today. Deepening or growing your faith takes time and effort. And it’s not for the weak. I don’t mean that people who don’t come to church are weak, but that if you are weak in the sense of being unable or unwilling to commit to God without proof, then long-term growth in faith will be difficult. One thing we must avoid is taking scripture literally when it speaks of ways in which God will care for us. If taken literally, we would end up believing that it is possible, and even likely, that we should receive from God a life free of stress and suffering, with all that we want, accompanied by absolute certainty in matters about God. That is not the result that those who wrote the scriptures intended. They have just taken a fair bit of poetic licence in the ways they describe God’s care and protection. If you look closely, you see that the scriptures are actually quite realistic in what they say is normal for a person of faith. There we find that hardship and suffering, doubt, and struggle are normal. What we believe in is God, not things going well. These days we use the world ‘belief’ to mean giving our assent to certain ideas, but until about 400 years ago, the word ‘belief’ was only used in regard to a person, such as to say ‘I believe in so and so’. To believe in God then, didn’t mean to agree with certain ideas about God, such as whether God exists and whether God protects us from snakes and provides a land flowing with milk and honey to live in, rather, it meant to trust in God personally, or to give your heart to God. We need to remember that our observations and judgements, our interpretation of life and expectations, are not equivalent to how God acts in the world, so it’s not the case that we can just rely on these to understand God. Rather, God transcends all that. What we are invited to put our trust in is God’s purposes within us. That means rather than waiting for the right circumstances to justify our belief in God, faith involves giving our heart to God. And there is a difference there, which we know from our experience with each other: if we meet a person and wait for them to show signs that they might be worth spending more time with, then our experience with them is one thing. If, however, at some stage we decide to become friends, from then on, new experiences emerge, which we otherwise might not have. So when it comes to faith, faith doesn’t change our external circumstances. We still might suffer and struggle, but our experience of that might be different.